With our recycled cocktail napkins you and your guests can keep your hands clean while you help to keep the earth clean as well. 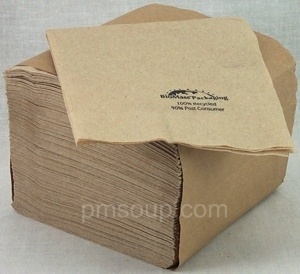 These paper napkins are made from 100% recycled paper with 90% being post consumer waste. They are a nice compliment to our many other organic products. The napkins are an unbleached, light brown color. The 5” x 5” size is perfect to be served with any appetizer or drink. Your guests will be impressed by the smart choice you have made by using a 100% recycled product. Each napkin has the manufacturer name and content printed on the back, right corner. It says: "BioMass Packaging, 100% Recycled, 90% Post Consumer."